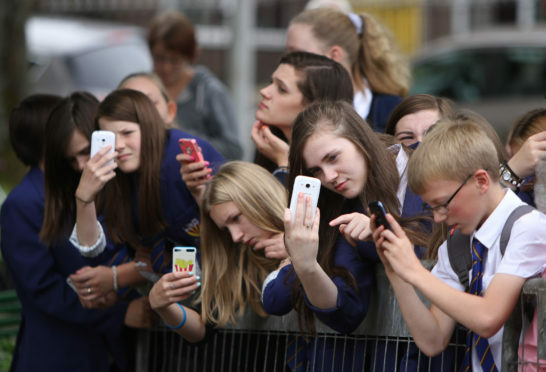 School children on mobile phones trying to get a picture of a statue unveiling in 2014. There seems to be a constant struggle between teachers and emerging tech, which was neatly summarised this week when two local schools offered opposing views on how to deal with mobile phones. Glenalmond College became the latest in Scotland to ban all smartphones, getting pupils to lock them away until lessons end. Staff say they are already seeing positive results, with better interaction amongst students and increased concentration on schoolwork. Just a few miles down the road, Morrison’s Academy revealed it was taking the opposite approach and encouraging students to use devices during class time responsibly. The argument is that pupils should be allow to keep hold of their phones, because – in the words of rector Gareth Warren – they “need to know how to navigate a technology-driven world”. Each approach throws up its own list of pros and cons. Letting students keep their phones by their sides will help them adapt more seamlessly with a world where technology is the embedded norm. After all, this the first generation to have grown up with smart digital technology and to assume they won’t be capable of using it responsibility does them a great disservice. But on the other hand, phones can be distracting, antisocial and, well, just too convenient for our own good. I often wonder how phones are affecting our capacity for thought and particularly problem solving. For example, if I’m strutting through a new town and I don’t know where I am, I no longer need to use my brain to find out. I can whip out Google Maps and get myself back on track without trying to work it out for myself, without the need to ask a stranger. I don’t even have to look up. Which Stevie Wonder album has the track Superstition on it? No need to rack your brains anymore, let your phone do the heavy lifting. In fact, I’m writing this on an iPhone during a trip to the supermarket. Hugely convenient, yes. But at what cost? It’s hardly giving my brain a work-out. We’ve been living with smartphones for more a decade now, and they’ve become an integral part of our lives. But we need to be careful, not to let them take control. And the key to this is teaching responsibility.